To a whole generation, something that seemed as if would never happen has happened: a significant number of the pioneers in rock & roll are getting up in years. Over time, the fortunes of veteran rockers has varied greatly. Some have retired from the scene, some occasionally take to the stage, while others have kept performing but find themselves limited to small-time venues and nostalgia shows with the time of their hit songs long since past, and the music world passing them by. Still others carry on, remaining true to their original music, while continuing to grow as artists. One of the fortunate phenomena on the 1990s is a growth in appreciation for the artists who laid the groundwork for rock & roll, through the blues and early R&B. Some of these artists' careers have been given a new lease on life by major record companies taking renewed interest in veteran performers, which has given them new opportunities for exposure to newer, younger audiences. This week's album is an excellent example. It's a new CD by someone who recently celebrated 40 years of performing rock & roll, and whose name is almost synonymous with the style: Bo Diddley. His new recording is called A Man Amongst Men. Bo Diddley was born Elias Bates in McComb Mississippi in 1928, but like many of his generation, came north with his family in search of work in Chicago. It was there that he learned violin and trombone for a church group. By his teens, he was playing in a succession of blues and R&B groups, beginning a long association with harmonica man Billy Boy Arnold. In 1955, after being rejected by Vee Jay Records for a song with raunchy lyrics called Uncle John, the Chess Brothers, who ran the famous Chicago record label that bore their name, convinced Bates to revise the lyrics, and the tune became Bo Diddley. It was released in April 1955 and became one of the most significant and influential rock & roll songs of all time with its "Shave and a Haircut" beat that became Diddley's trademark and the pattern for hundreds of rock & roll songs over the years. Bo Diddley had a string of hits through the early 1960s, and though he began to lose favor in the US, he became very popular in England, where his records served as an major influence on the generation of British rockers from the Beatles to the Stones and the Yardbirds, who performed many of his songs, to the band Pretty Things, who named themselves after one of Diddley's songs. Years later, his influence on the British rock scene continued as he was invited to perform with the Clash, who also looked upon him as an inspiration. While he was eventually inducted into the Rock & Roll Hall of Fame in 1987, through the 1970s and Eighties, Bo Diddley recorded on and off, with not very memorable results. Now he is out with one of the best albums of his career. The record was produced by a Briton, Mike Vernon who goes back to the mid 1960s, working with groups in the British blues movement. The recording features both British and American musicians, with some name guests, including Ron Wood and Keith Richards of the Rolling Stones, Jimmy Vaughan, formerly of the Fabulous Thunderbirds, bluesman Johnny "Guitar" Watson, who just passed away, and even Richie Sambora of Bon Jovi, all on guitars, plus harmonica man Billy Boy Arnold, and even the Shirelles, one of the classic girl-groups of the early 1960s doing backup vocals. Diddley wrote all new material for the album, which turns out to be more of a straight blues recording than one might expect. Bo Diddley is in great form, with his vocals strong, assured and animated, and his playing, on his famous rectangular guitar, a design he originally built himself, is also sounding great, though he does tend to get eclipsed a bit by all the guest guitarists. He proves to be a outstanding blues performer, and a better singer than many blues specialists. The album was recorded all over the place, in New York, Chicago, California, Austin, Texas; London, and Dublin. The various disparate guests likely recorded their parts separately with the tapes travelling to the guest players where they added their parts, but it does sound as if the basic rhythm section was recorded live. For such a piecemeal recording project, it sounds very coherent and organic. The material ranges from straight Chicago style electric blues to rockabilly, to the famous Bo Diddley beat to a funky tune with a rap by Diddley's grandson. Almost all of it works well, and throughout, Bo Diddley demonstrates that he seems to be improving with age. Bo Diddley's new album A Man Amongst Men, marking his 40th anniversary playing rock & roll is certainly not the recording of a has-been rocker. Diddley is in fine form, both vocally and in his guitar work. He also sounds as if he is thoroughly enjoying himself. The backing band comprised of guest stars, long-time associates of the rock pioneer and members of his current band provide a first-rate support, and get to share the spotlights themselves with opportunities for solo slots. Except for the reggae tune coming out of left field, Diddley's new songs do sound a lot like old songs, but since he laid an important stone in the foundation of rock, that's nothing to complain about. 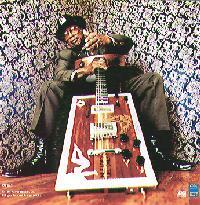 And ignoring the fact that this is Bo Diddley, it's still a outstanding blues-rock album. The production and sound are above average. The album sounds surprisingly organic considering how it was recorded with different musicians recorded in different studios in different parts of the world at different times. Also the arrangements don't sound very cluttered, even when there are a lot of musicians featured. One can hear everything in the mix, so producer Mike Vernon and mixing engineer Barry Hammond deserve kudos. The only gripe I would have is with the electronically generated harmonies on Diddley's vocals. Most of the time they are OK, but once in a while they can get a bit out of hand. A Man Amongst Men shows that after 40 years, Bo Diddley lives up to the album's title, and still rock with the best of them.